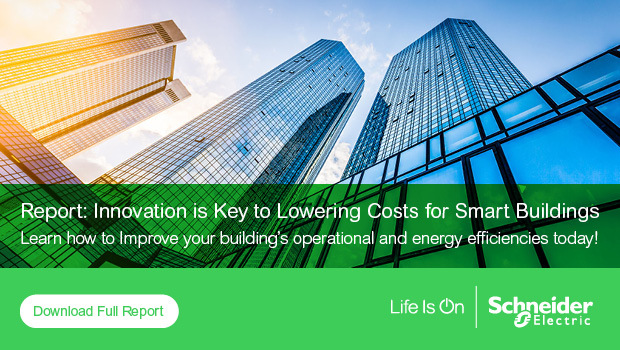 This is the third in a series of posts discussing the recent report from industry analyst Verdantix titled ‘Schneider Electric Innovates To Lower Cost Of Smart Buildings’. The first two posts offered some perspective on how trends in the Internet of Things (IoT) and circuit-level intelligence are helping all kinds of organizations improve operational and energy efficiencies. In this post, I’ll talk about how IoT technology is opening the door to a new generation of hosted services that are helping small and mid-size enterprises optimize asset, maintenance, and energy management. I’m specifically referring to industrial, retail, public, and healthcare facilities typically under 15,000 square meters (160,000 square feet). If you own or operate such buildings, you understand the challenge of having to work with limited resources in the face of rising operational costs. Not only is it tough to keep up with maintenance, but there’s also a lot of savings you may be missing. A study by the Preservation Green Lab estimates that energy savings ranging from 27 percent to 59 percent of current energy use are possible in small buildings, depending on type. Fortunately, connected products are making possible a choice of cost-effective services to support facility teams, filling in the gaps where more insight, expertise, and support are needed. It starts with connected sensors, meters, and gateways gathering data continuously from heating, cooling, and lighting systems, as well any other important loads throughout one or more facilities. Critical points through the electrical distribution system, including any onsite energy generation and storage, will also be monitored. All of this can come from dedicated devices or embedded metering and control intelligence in building management systems, circuit breakers, etc. A Cloud-based software platform delivers the data visualization to help facility teams or contracted services understand equipment and energy conditions and trends, make decisions, and take action. Services are typically provided through a combination of the solution provider and highly-trained local partners. Various levels of service may be offered, tailored to the needs of the organization. For example, Schneider Electric offers four incremental, subscription-based options under its Facility Insights services. The first level gives the facility team desktop and mobile access to energy data and targeting, with regular reports that simplify energy analysis. At the second level, certified experts use sophisticated analytics to track energy performance, benchmark performance across multiples sites, flag out-of-range trends, and provide recommendations for energy upgrades to help reach objectives. The next level adds operations support by analyzing power quality conditions throughout the facility, providing asset maintenance reminders and task scheduling tools, and recommending steps to further improve maintenance and energy efficiency. The fourth level goes deeper by delivering complete energy conservation and maintenance action plans, as well as supporting energy contract optimization. And what is the bottom-line impact you can expect? Schneider Electric estimates that Facility Insights will enable a 10% increase in equipment uptime and an estimated 8% decrease in maintenance costs. In regard to energy efficiency, an 800 square meter childcare center in France achieved a 15% reduction in energy costs within the first six months of operation through optimization of building system scheduling, with an additional 8% of savings opportunities identified for future implementation. In the next post in this series, we’ll look at another area of innovation reported by Verdantix: how energy storage is helping organizations benefit most from onsite renewables and the smart grid. For more information on buildings and IoT, read this blog series.